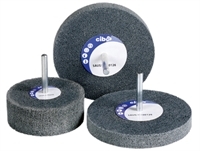 Applications: These wheels are ideal for cleaning, stripping and polishing areas of metal with drills, air-tools and flexible shaft machines. Grades F-3 and F-4 have conformable, open structures, which makes them ideal for surface cleaning and preparation without gouging. This makes them particularly suitable for stripping coatings off and cleaning aluminium. They are also ideal for preparing tube ends on carbon fibre and plastics. The S-5 and S-7 grades are more dense in structure. Grade S-5 is ideal for brightening stainless and can significantly reduce the steps towards polishing the surface. Grade S-7 has more aggression for light stock removal, such as tidying up TIG welds. Product Notes: Part of the new Cibo Rebel One range. The lower the grade number, the softer the wheel. All of this range is supplied on 6mm spindles to suit die-grinder collets and drill chucks. Optimum speed for performance and life is approx half of the max speed. Prices are per pack of 5. Also Available: We also supply small unitised tips and small spindle mounted wheels for detailed polishing. For fixed spindle machines, we offer a range of unitised wheels with centre holes as well as convolute wheels in larger diameters.